One of the most common frugality tactics is to find ways to reduce your water bill. There are many, many ways to do this in your average home, but several tactics seem to pop up time and time again. The question is: do these tactics really save significant money? Is it enough to make the move worth the hassle? Let’s dig into five of these methods and find out. In order to do some of the calculations below, I had to make a few basic assumptions. First, I’m using a cost of $0.0015 per gallon for the water. I obtained this estimate from offline research materials provided by the American Water Works Association. This means that 1,000 gallons of tap water will cost you about $1.50. Second, I did usage counts in our own home in order to make calculations. I basically assumed that my own family is the “average American family,” in other words. Putting a plastic bottle in your toilet tank. The average home toilet tank uses roughly a gallon and a half of water per flush, though older toilets often use substantially more. When you flush, this water goes straight down the bowl, costing you roughly two-tenths of a cent. However, for almost all flushes, one does not need nearly that much water to expel the contents of the bowl. The solution often prescribed for this unnecessary water usage is to take a plastic soda bottle, fill it with water (and perhaps a few pebbles to weight it down), then put that bottle into your tank. This reduces the amount of water in the tank at all times and thus reduces the total amount of water your toilet uses. How much does this actually save? Let’s say you put in a 20 ounce soda bottle into your tank, which is 0.16 gallons. This would reduce your average flush from 1.5 gallons down to 1.34 gallons of water used. How many times do you flush? I did a count at our home and counted a total of sixteen flushes over a day-long period at our home (two adults, two children). Using that metric, putting a bottle in our tank would save us 2.56 gallons of water per day. Over the course of a full year, that’s 934.4 gallons saved. In dollars and cents, that bottle would save us $1.40 a year. Is it worth doing? Considering it’s something you can do in a minute and that it lasts for years and years, it’s probably worth the time. There’s no real downside to it, either – for virtually all flushes, the small fraction of water saved will make no difference at all. For us, it was a no brainer – we did it. Installing a low-flow shower head. The Washington Suburban Sanitary Commission reports that a normal shower uses 8.5 gallons of water per minute. In comparison, a low-flow showerhead uses (depending on the model) 1 to 3 gallons of water per minute. Our home currently has a mix of normal flow and low flow heads. I asked around for a recommendation for a low-flow shower head and a friend pointed me toward an Alsons 657CBX – which allows you to switch between 1.85 and 2.5 gallons per minute. The plumber liked this model because, as he put it, some people don’t like the low flow setting but enjoy the higher flow one. The model costs $25 via Amazon and is easy to install. So, what do real-world showering times look like? Over the course of a week, I estimated that there were thirteen showers taken in our home, averaging twelve minutes in length per shower, a figure that my wife concurred was “reasonable.” This adds up to 156 minutes of showering in a week and, thus, over the course of a week, the shower head above will save us 1037.4 gallons of water (assuming we are replacing a high-flow showerhead). That adds up to a savings of about $81 per year! However, there are some drawbacks here. Replacing the shower head in your home might not save you that much water. If your initial shower head is reasonably efficient, your savings won’t be that tremendous. Second, low flow showers can be unappealing to some bathers. I don’t mind them (except for washing my hair, which takes a bit longer), but others can be frustrated by them. Don’t get an ultra low flow showerhead. It can be worthwhile to get a lower flow showerhead – and it can save you significant money, indeed – but don’t jump on board the lowest flow head you can find or it may seriously degrade the quality of your showers. Taking “on the clock” showers. For a long while, I got in the habit of taking very brief showers. I used a timer and established a routine of taking five minute showers, shaving seven minutes from my shower time. Now, I don’t worry about it quite as much – I take quick showers if I need the time, but quite often I take showers around ten minutes in length. So, let’s say you’re able to shave two minutes off of your daily shower and your shower head is an average one – 8.5 gallons per minute. That means in an average week, you can save 119 gallons of water – saving you about $9.31 per year. What I found is that shaving a small amount of time from your shower doesn’t make a noticeable difference and can easily become the norm without any quality reduction. However, if you shave a lot of time, it can really cut into your ability to adequately get clean. My Suggestion: Try shaving just a minute or two off your shower. One good way to do it is to just consciously keep moving while showering – scrubbing away instead of just standing there. Washing only full loads of clothes. My wife and I tend to naturally run full loads with every load we run, so this tip didn’t particularly impact us. Of course, I know of at least one person who refuses to run a load much larger than half a basin, claiming that it doesn’t get clothes adequately clean. So, let’s say an average load actually fills up three quarters of a bin and you do two loads of laundry per week – 104 loads per year. Filling up the bin each time would thus save 26 loads per year. Using the Washington Suburban Sanitary Commission numbers, a load in a top-loading washer uses 60 gallons, which would thus save 1,560 gallons a year – $2.30. Especially if the strict cleanliness of your clothes is something of personal concern to you. The more direct change you can make is simply to add an item or two to your loads without overloading your washer. Shaving with a basin rather than a running tap. 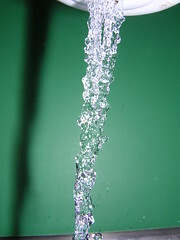 The city of Tampa reports that an average tap dispenses three gallons of water per minute. When I shave at the sink, I usually spend about four minutes shaving, meaning that a running tap wastes twelve gallons of water. Alternately, I could run a gallon of water into the basin, turn off the tap, and simply use the water in the basin, saving eleven gallons of water per shave. If you shave every day, that simple change would save 4,015 gallons of water per year – $6.03. This is a simple change that you can use with many common tasks. Fill the basin instead of running the tap when you brush your teeth, wash your face, shave, do dishes by hand, and so on. What’s the general conclusion here? One time fixes and minor behavioral changes when it comes to your water use are usually worth it – but only over the long haul.